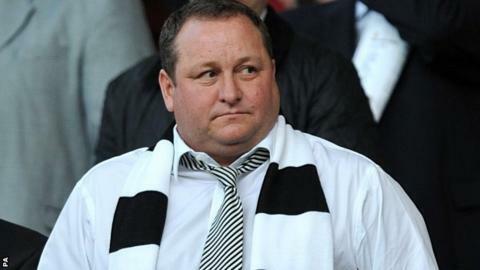 Newcastle owner Mike Ashley says he "regrets" buying the club and that its bank account is virtually empty. The Magpies are second from bottom of the table despite more than £82m being invested in the squad in the past two transfer windows. When asked how much money was left in the club's bank account, he told the Daily Mirror: "Virtually nothing now. They have emptied it." Ashley has vowed to stick by the club, even if the Magpies are relegated. He said: "I'm wedded to Newcastle. They have got me and I have got them, that's just the way it is." Newcastle are three points from safety with eight games remaining and are in danger of losing their top-flight status, which they have held since 2010. "Do I regret getting into football?" said Ashley. "The answer is yes. I have had tonnes of fun in it but I haven't been able to make the difference I wanted to in football." Relegation to the Championship would mean a huge drop in revenues for the club. Ashley said: "All I say is, there is a bank account, when you have emptied it, it's empty. Don't come crying to me for more money." The Sports Direct owner, who bought the club in 2007, has seen his time in charge filled with controversy, but he has backed investment in the squad and handed over a £129m interest-free loan, according to the last published club accounts. Ashley has become increasingly disillusioned with the "negativity around me as an individual when it comes to Newcastle" and admitted he wants to have less involvement in the club. He said: "I don't really want to have any influence in football to be honest. Looking after Sports Direct is more than a full-time job." Ashley expressed his faith in former Real Madrid boss Rafael Benitez, who replaced manager Steve McClaren earlier this month, but admitted he did not appoint him and is yet to speak to the Spaniard. Speaking to Sky Sports on Monday, he said: "I think we have the right man in the job. If there's any chance of us staying up, let's hope Rafa can do the business and keep us up there." Ashley was disappointed his side had not beaten fellow strugglers Sunderland on Sunday, but said the 1-1 draw was "not a disaster". He said: "It's disappointing because I want to win every game for Newcastle United and it really doesn't matter who they are playing. "It doesn't matter if it's a friendly, doesn't matter what it is, but I wanted us to win, so I'm a little disappointed."